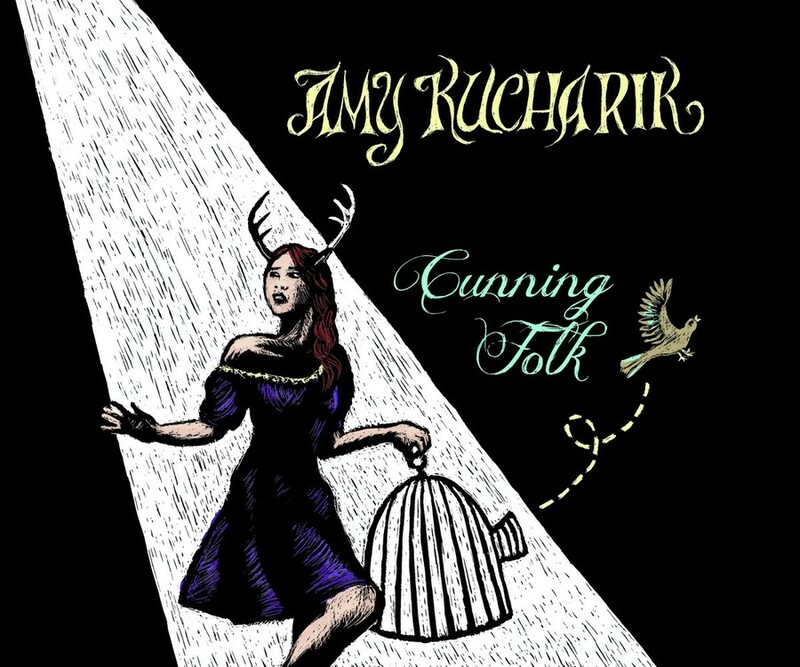 “My songwriting probably wouldn’t have happened if I hadn’t studied and written poetry..."
The cover of Amy Kucharik's new album, Cunning Folk. Depending on who you ask, the ukulele is an instrument that people tend to most readily associate with Hawaii, Eddie Vedder, or the “Lava” song. Amy Kucharik’s music, however, shows that the ukelele also has an important place in the blues and swing dance scene—and beyond. Cunning Folk is the first full-length album to come from Kucharik, a Boston-based singer-songwriter. Kucharik—who has an MFA in poetry, makes all of her album art, and is a longtime swing dancer—finds that all the art forms she loves unite when she produces an album. Kucharik says that she often thinks about what kind of musical elements dancers will like when she composes a song, especially since a community of dancers often perform at her Boston shows. For her, dancing and music-making are firmly connected; she even sees parallels between the lead-follow dynamic in partnered dancing and directing a band. For Cunning Folk, Kucharik expanded the scope of her composition, incorporating both the cello and violin to create a more diverse sound. The ways in which sources have shaped her music are equally diverse: the 1920s–1930s blues women inspired her lyrics, the songwriter Meschiya Lake influenced the New Orleans horn sections in her songs, and various types of world music informed her songwriting. And it doesn’t look like she is going to stop there. Ultimately, Kucharik said that “it is more about the songs than it is about the instrument.” In a similar way, she thinks that genres are more helpful in selling records than they are for defining what a piece of music sounds like. When listening to Cunning Folk, you will certainly hear the ukulele in a different light. Beyond that, you will hear elements of folklore, heartbreak, a sense of self-reliance, and most irresistibly of all, rhythms that urge you to move your feet. Kucharik will be performing at Uncommon Ground next Wednesday with Keith Burman and Jim Swayzee. 7–9 p.m., $5.